The AG-440C Tape Recorder/Reproducer is available mounted in an Ampex console, mounted in portable cases, or unmounted for vertical or horizontal installation in a rack or custom console. The basic system consists of a tape transport, a head assembly, and one	record/reproduce electronic unit for each channel. The AG-440C Recorder/Reproducer can be configured for use with 1/4-inch or 1/2-inch width magnetic tape. Available head assemblies permit one, two, or four channel recording or reproduction. Each record/reproduce unit contains a built-in Sel-Sync circuit for recording added channels in perfect synchronization with previously recorded channels. Plug-in accessories, such as a microphone preamplifier, a matching transformer (600-ohm impedance), and a remote control unit are available as optional equipment. All components of the tape transport are mounted on a rigid-casting base. Mechanical features allow changing from one tape width to the other in a few minutes. The tape transport consists mainly of subassemblies which may be removed without unsoldering connections. The heads plug into receptacles inside the head housing for easy removal and installation. Most relays and electronic circuits are the plug-in type. Three standard tape speed pairs are available: 3-3/4 or 7-1/2 in/s (inches per second), 7-1/2 or 15 in/s, and	15 or 30 in/s. Speed selection is made by a toggle switch, and electronic equalization is automatically switched according to the speed selected. The transport, as delivered, will accommodate tape reels 10-1/2 inches, 8 inches, 7 inches, and 5 inches in diameter. Any combination of a large NAB hub and small ElA hub may be used by setting the REEL	(tension) switches accordingly. Also, the turntables can be easily repositioned for use with an 11-1/2 inch IEC reel. Tape scrape-flutter is minimized by a scrape-flutter idler that is mounted on jeweled bearings and located between the record and reproduce head stacks. An optional second idler may be installed to the left of the record head. Two solenoid-actuated arms automatically move the tape from contact with the heads during the fast forward or rewind modes. For editing and cueing operations, electronic override of the tape lifter is provided by pressing the EDIT pushbutton. A plug-in printed circuit card containing the power supply regulator and master bias and erase oscillator is	mounted	in a power supply box on the underside of the tape transport. Pushbutton controls at the transport lower right edge select operation modes: RECORD, PLAY, REWIND, FAST FWD, STOP, and EDIT. These switches are on the front of the tape transport control box. The control box has externally-mounted main fuses, cable receptacles for transport sub-assemblies, and plug-in relays for the play, rewind, fast forward, and edit functions. One record/reproduce electronic unit is required for each recorder/reproducer channel. The record/reproduce unit consists of an electronic chassis with three plug-in modules. The modules, removable through a front panel cut-out, are guided to printed circuit board receptacles when inserted in the chassis. The three removable modules provide amplification for record, reproduce, and bias. The record and reproduce modules each contain plug-in equalization circuitry mounted at right angles to the main boards, so electronic alignment controls are accessible through the front panel cutout. Equalization is automatically switched (according to the tape speed selected) by solid-state switching circuits. Receptacles for interconnect cables, accessories, and input/output-signal cables are on the backpanel of the chassis. Also accessible from the rear of the unit are: a line-termination switch (to select correct termination resistance during maintenance procedures), a meter sensitivity switch (to permit selecting +8dBm or +4dBm output level), a switch for selecting output impedance (150 ohm or 600 ohm), a plug-in record relay, and a power fuse. The recorder/reproducer is shipped	from the factory with a	dummy plug inserted in the INPUT ACCESSORY socket. With the dummy plug installed, an unbalanced-line input is provided (input impedance is 100,000 ohms). A supplied bridging transformer is inserted in the INPUT ACCESSORY socket when a balanced-line input is desired. Input impedance with the bridging transformer installed is 20,000 ohms. The erase, record, and reproduce head stacks are usually mounted in head mounting positions 1, 3, and 4, respectively but other combinations are possible. 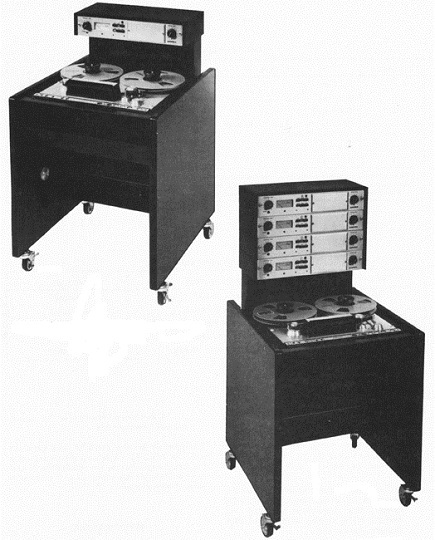 Do you have content, to add, about the Ampex AG-440C Tape Machine or associated topics? Please feel free to Share it, here!